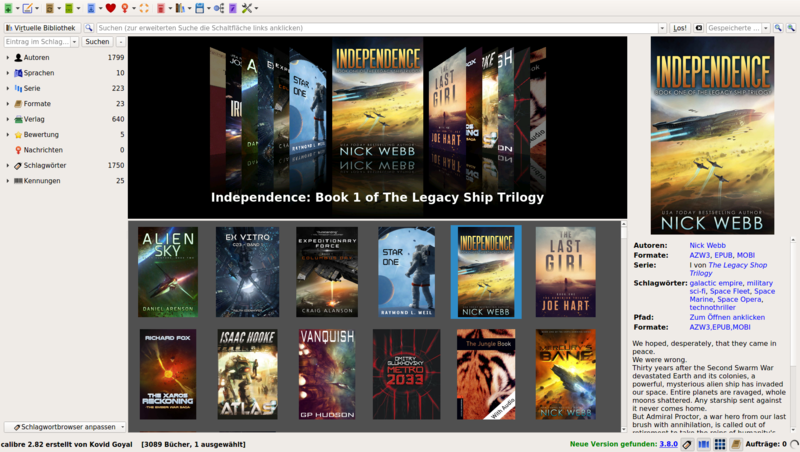 calibre is a powerful and easy to use e-book manager. Users say it’s outstanding and a must-have. It’ll allow you to do nearly everything and it takes things a step beyond normal e-book software. It’s also completely free and open source and great for both casual users and computer experts. sudo -v && wget -nv -O- https://raw.githubusercontent.com/kovidgoyal/calibre/master/setup/linux-installer.py | sudo python -c "import sys; main=lambda:sys.stderr.write('Download failed\n'); exec(sys.stdin.read()); main(install_dir='/opt')"
Vieles Infos hier auf https://www.digitalocean.com/ aber ich empfehle aktuell den OPDS Server zu verwenden. #!/bin/bash rsync -q -rtze ssh /home/user/Calibre-Bibliothek/ user@heavy.ch:/home/user/bibliothek/ ssh user@heavy.ch "/home/user/bin/calibre-restart"
"Digital Cowboys since the decline"
Ein persönlicher Blog über die Welt, Tech und 20°. Copyright © 2017 by HEAVY. All rights reserved.